Launched in October 2013, the One Corporate System (OCS) is part of the International Rice Research Institute’s (IRRI) strategy to improve processes and partnerships within the CGIAR and help staff manage projects, human resources, finances, and other administrative functions more efficiently. By 24 November IRRI is preparing to upgrade the OCS software to Milestone 4 (MS4) for improved capabilities and better user experience. 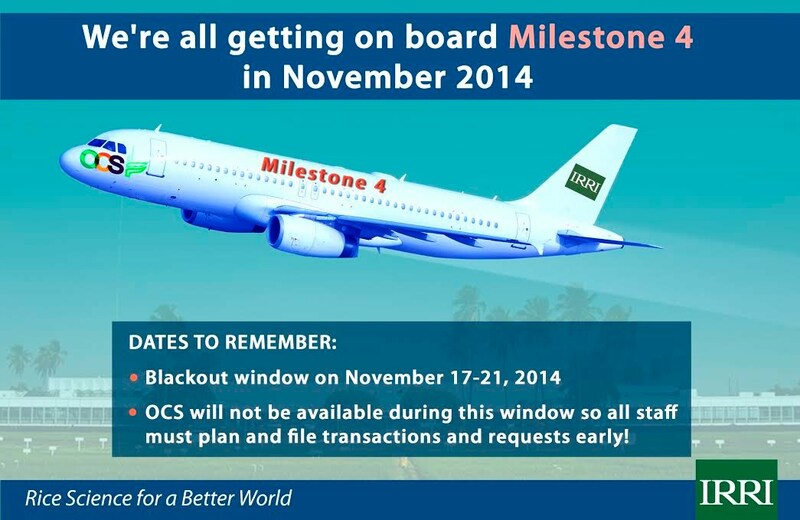 In order to migrate to MS4, IRRI will implement a “blackout window” on 17-21 November. During the blackout window, OCS functionality will not be available. According to IRRI-OCS Project Manager and IRRI Chief Information Officer Marco van den Berg the blackout may be disruptive, but there is no alternative way. "All staff need to ensure that leave requests, purchase requisitions, personnel requests, concept notes and proposals, etc., are up to date before the blackout period starts,” said Mr. van den Berg. “For critical unexpected events, such as sudden travel requirements during the blackout period, IRRI will provide workarounds to ensure business continuity." In the initial announcement on the upgrade Mr. van den Berg issued on 19 September,he mentioned that the new software will give the OCS system a “Facebook” look and fix some bugs in the current version. To ensure that the new version of OCS works for IRRI, testing of all existing functionality on a separate trial system is being conducted. "So far, the testing is going well.” he added. “ The experience with the new version has been quite positive. People like the fresh look and learned to use the new buttons easily. While we’ll never be able to make administrative software fun to use, but we do aim to make it easier to use." Walk-in training sessions for staff members on the use of MS4 will be organized around the time the software will go live.